I've finally done it, I've made a quilt! Surely a milestone in every sewing journey. I wanted to make something practical yet totally gorgeous for a very special couple who are expecting their first child, something precious which can become a family heirloom. And isn't this the cutest design? The piped edging creates such a neat and unusual finish yet it's the easiest quilt ever, perfect to make in an afternoon. How so quick you ask? Shhh...I'll let you into a secret, it's a 'cheater quilt'! Well a 'cheater quilt' is an ideal introduction to quilting. It's basically a quilt using pre-printed patchwork fabric for the top, layered in the traditional way with batting and backing fabric and finished off with binding. In this case a piped edging. You can then follow the fabric design to sew the quilting lines. 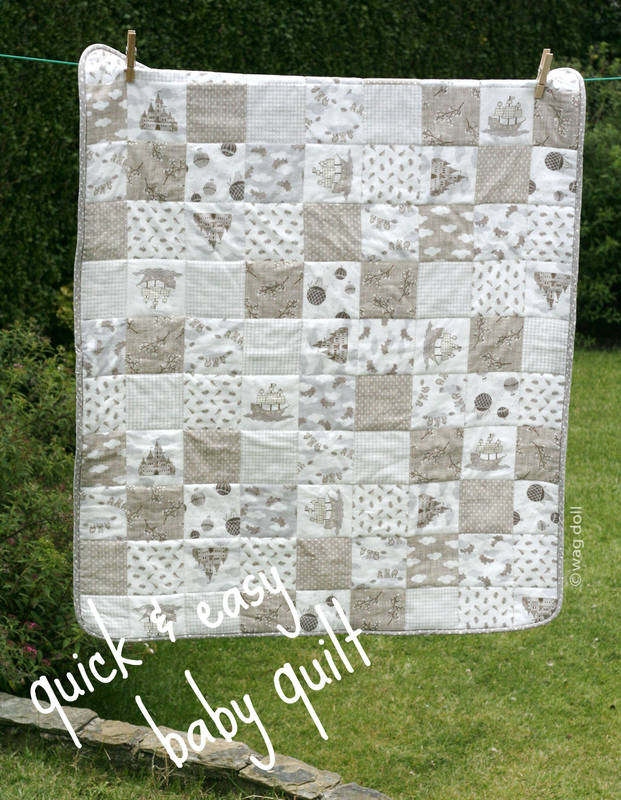 So quick and easy, a perfect first quilt. 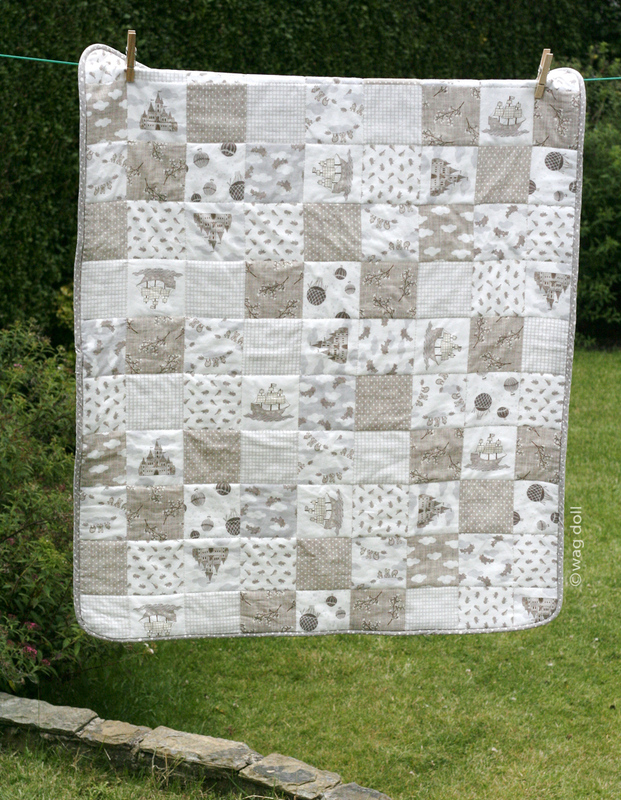 I chose Moda fabrics for the quilt, using Storybook Patchwork for the top, a supersoft brushed cotton in stone. 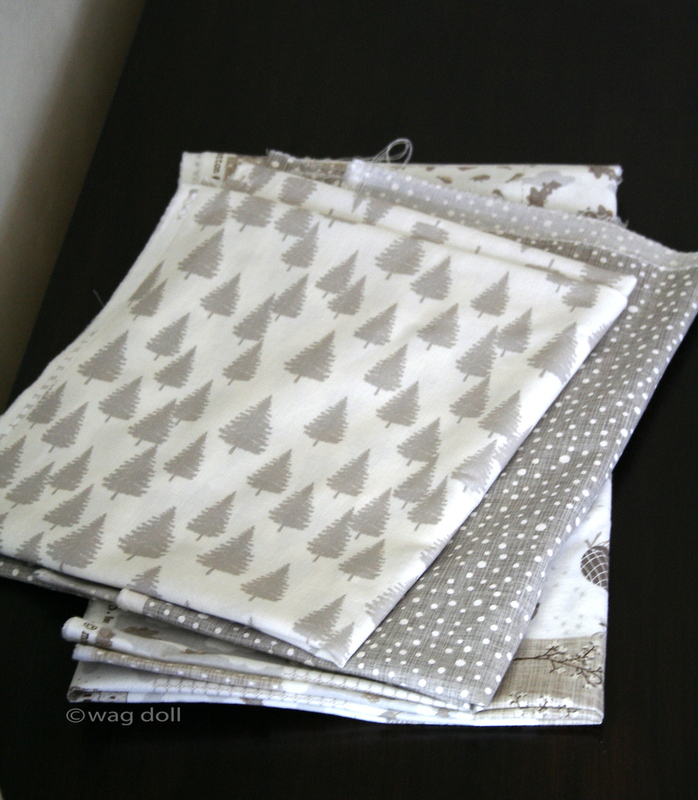 Winterberry Forest in stone for the backing fabric and Winterberry Snowy Dots for the piping. Hobbs Heirloom premium cotton wadding is the perfect batting for a cosy yet lightweight quilt. Be sure to pre-wash the fabric to ensure even shrinkage, and because it's always best to wash bedding and clothes in sensitive 'free-from' detergent for a newborn's beautiful delicate skin. Ah...little newborns, all soft skin, fluttery eyelashes, tiny fingernails and milky burps, love 'em! 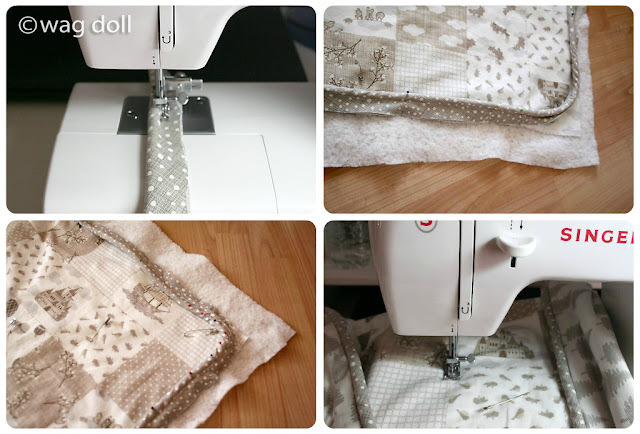 In terms of making the quilt, follow the detailed instructions from Sew4Home carefully and you can't go wrong. The piping is actually very easy to make, a long ruler comes in handy for cutting the bias strips. I pinned the heck out of the whole thing when sandwiching it together, so have lots of safety pins handy. And I found rolling the quilt up helped when doing the middle quilting lines, rather than trying to stuff large amounts of quilt under the arm of the sewing machine!...You live and learn. 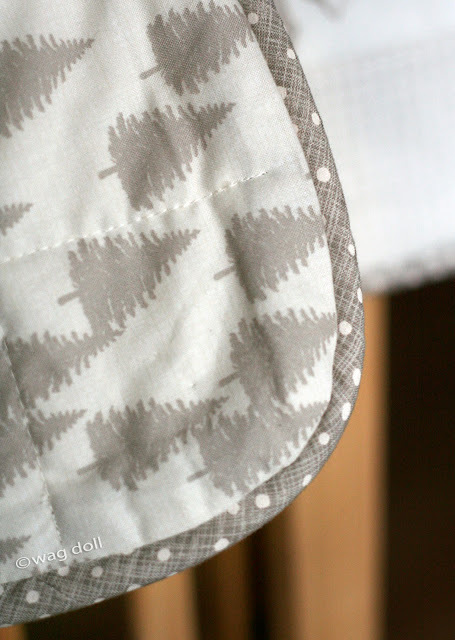 Rounding the corners helps to ease the piping into place, and creates a lovely soft edge. All in all I was pretty pleased with how this project turned out, and it's given me the confidence to tackle a quilt from scratch. 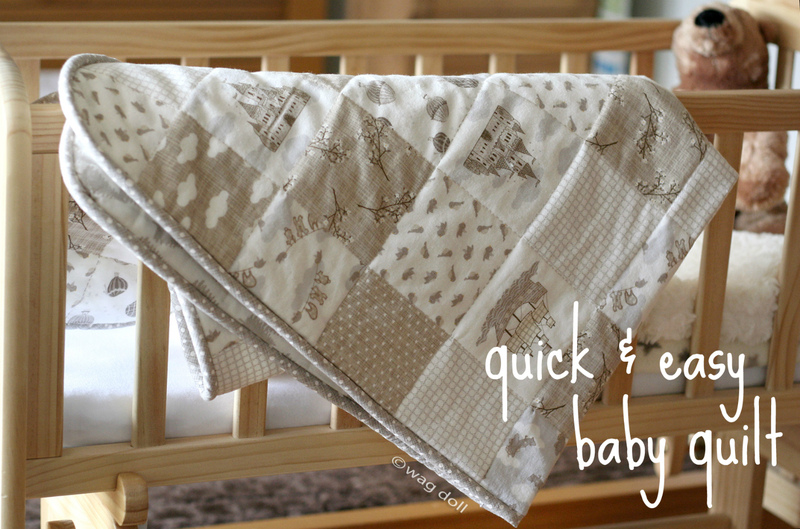 So if you're looking for a special gift for a baby shower, or just want to try quilting for the first time, this Quick and Easy Baby Quilt is a winner, and luckily the parents-to-be thought so too! 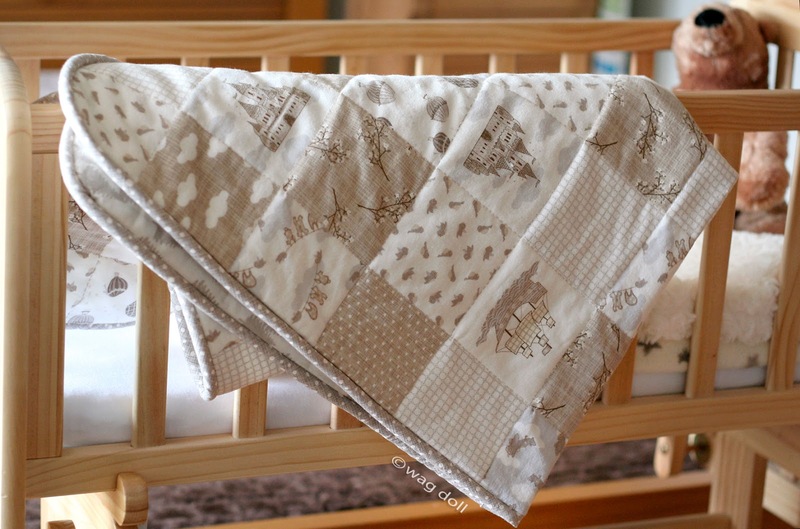 I love your quilt I never thought of light brown for a baby but it works beautifully. I really like the piping too.